The Educational Opportunity Center (EOC) is proud to announce their spring FAFSA workshops for individuals who are looking to attend training or college in the Summer and Fall. Workshops are held every Friday at 4500 Diplomacy Dr. and on April 28th at Nine Star’s 4th Avenue location! Spaces are available for all workshops from 1-4p every half an hour. Interested individuals can reserve their space by calling the main EOC office at 907-786-6707. EOC provides free educational advising to adults in the Anchorage and Matsu areas. Their services include: Career Exploration, Assistance Finding a school or training program: HS/GED Completion, vocational training and college programs, Admissions Assistance, and Financial Aid Assistance: help completing the federal financial aid application (FAFSA). For one-on-one advising appointments call 786-6707. If you have clientele who need this assistance in workshop form or want more information about our services please feel free to contact Krista Stormo, Community Outreach Specialist, Educational Opportunity Center, ankjs5@uaa.alaska.edu, 4500 Diplomacy Drive, “The Diplomacy Building” Suite 105, Anchorage, AK, 99508, (907) 786-6707 office, (907) 786-6710 direct, or (907) 786-6713 fax. http://www.uaa.alaska.edu/eoc/. Cook Inlet Region, Inc. (CIRI) is currently recruiting for a Corporate Administrator, Executive Offices. Attached is the job description. To apply, please submit a resume, letter of interest and a CIRI employment application (also attached) to: Cook Inlet Region, Inc., Attention: Susan Williams, PO Box 93330, Anchorage, AK 99509-3330. If you have any questions regarding this position or other employment opportunities, call Susan Williams. Human Resources Assistant. Cook Inlet Region, Inc. (CIRI). PO Box 93330, Anchorage, AK. 99509-3330. 907.263.5123 (phone), 907.263.5508 (fax). Friday, April 2nd from 3 to 8 pm at UAF Bowers Building, Suite 101, 2175 University Avenue South, Fairbanks. Please join Dr. Jerry Lipka and the MCC staff for refreshments at an open house featuring the art of Elizabeth “Putt” Clark, celebrating the decades of work creating math modules centered on Yup’ik values and culture for elementary students. For more information email nicolle.mcc@alaksa.edu, call 474-2611 or visit www.uaf.edu/mcc/. The National Museum of American Indian is pleased to announce a call for entries for the annual Young Native Writers Essay Contest. Five selected essayists, and the teachers that inspired their participation, will win an all-expenses paid trip to Washington, D.C. in July 2010 and a $2,500 scholarship. The contest is open to Native American High School Students enrolled in grades 9-12 only. The deadline for essays is May 2, 2010. The Cooperative Education Program at Johnson Space Center is open to graduate and undergraduate students from around the country. As a Co-op, you will regularly alternate semesters at school with semesters at JSC working in a paid, full-time position directly related to your field of study. This supplements lessons learned at school and gives valuable real-world experiences you won’t get in a classroom! Our program involves students from many academic fields, including Aerospace, Mechanical, Electrical and Computer Engineering; as well as limited positions in Business, Science, and Liberal Arts. We have roughly 160 students from 50 participating schools and nearly every state in the nation. Click below for more information or visit http://coop.jsc.nasa.gov/index.htm. Doyon Foundation student Daphne Attla graduated from high school last May and is close to wrapping up her freshman year at the University of Alaska Fairbanks (UAF). As she’s transitioned into college life, Attla said her biggest challenge has been time management. “I work part-time and go to school full-time. I am learning to prioritize my time,” said Attla, who expects to graduate in 2013 with a bachelor’s of science in chemistry and hopes to become a pharmacist in the future. In addition to school and work, Attla has also volunteered her time, participated in the Rural Alaska Honors Institute (RAHI) Next Step program, and plans to join some clubs at UAF. 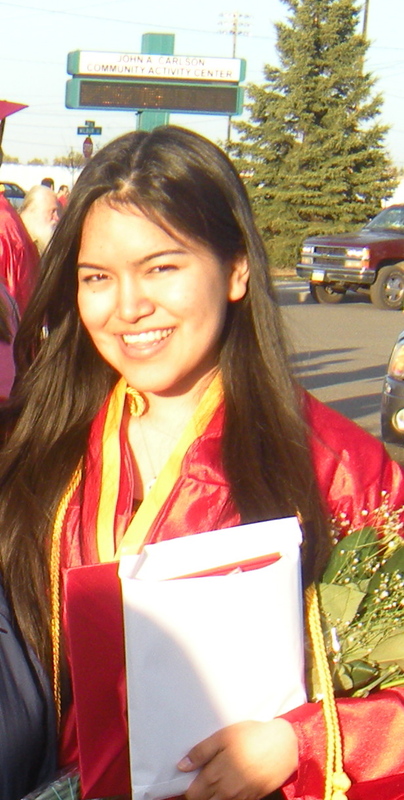 In high school, she was active in the Alaska Native Education Leadership club and the Spanish club. “My advice for success is to study. I am learning time management, which means to turn off the TV. Also ask for help when needed, which means going to the math lab or the professor. Also remember to have confidence in your work,” Attla said. As a current scholarship recipient, Attla said Doyon Foundation has helped her tremendously. “I am very thankful for the help in tuition that Doyon has provided for me,” said Attla, who is the daughter of Marilyn John, and the granddaughter of Shirley Vent and George Attla, and Emily Sam and Tony Sam. · AI/AN Medical Student Scholarship to attend AAIP Event: The Association of American Indian Physicians (AAIP) is currently accepting applications from AI/AN medical students to attend the 18th Annual Cross Cultural Medicine Workshop (CCMW), which will be held Thursday April 22 – Sunday April 25, 2010, at the Hotel Santa Fe in Santa Fe, New Mexico. Scholarships will cover airfare, hotel accommodations, workshop registration, and most meals. To apply for the scholarship, you must submit a Primary Data Sheet and a one-page essay explaining why you wish to attend and what you hope to gain from attending the workshop. Applications and essays must be in the AAIP office no later than Friday, April 2, 2010. For more information, visit the AAIP student website at http://www.aaip.org/?page=AAIPStudents. · AI/AN College Student Scholarship to attend AAIP Event: The Association of American Indian Physicians (AAIP), Careers in Health for Native Students Program and the Office of Outreach and Multicultural Affairs (OMA) and Indians into Medicine (INMED) Program of the University of Arizona, College of Medicine will conduct a Pre-Admission Workshop (PAW) on April 15 – 18, 2010. Scholarships available to American Indian and Alaska Native (AI/AN) undergraduate and graduate students interested in the health field. Scholarship will cover airfare, lodging and meals. Applications must be in the AAIP office by Friday, April 2, 2010. For more information, go to aaip.org. · AI/AN High School Student Scholarship to attend AAIP Event: The Association of American Indian Physicians (AAIP) will award AI/AN high school students, ages 16 – 18, to attend the NNAYI program, which is held each June in Washington D.C. Students who have an interest in a health profession or biomedical research are encouraged to apply. The NNAYI Scholarship pays for lodging, airfare, and most meals. Applications are available at: http://www.aaip.org/?NNAYISTUDENT. Application deadline is April 16, 2010.